The U.S. military has some of the most advanced killing equipment in the world that allows it to invade almost wherever it likes at will. We produce so much military equipment that inventories of military robots, M-16 assault rifles, helicopters, armored vehicles, and grenade launchers eventually start to pile up and it turns out a lot of these weapons are going straight to American police forces to be used against US citizens. 1033 was passed by Congress in 1997 to help law-enforcement fight terrorism and drugs, but despite a 40-year low in violent crime, police are snapping up hardware like never before. While this year’s staggering take topped the charts, next year’s orders are up 400 percent over the same period. This upswing coincides with an increasingly military-like style of law enforcement most recently seen in the Occupy Wall Street crackdowns. This comes on top of grants from the Department of Homeland Security that enable police departments to buy vehicles such as “BearCats” — 16,000-pound bulletproof trucks equipped with battering rams, gun ports, tear-gas dispensers and radiation detectors. To date, more than 500 of these tank-like vehicles have been sold by Lenco, its Massachusetts-based manufacturer, according to a report in the Orlando Sentinel. “It’s kind of had a corrupting influence on the culture of policing in America,” Lynch says. “The dynamic is that you have some officer go to the chief and say, people in the next county have [military hardware], if we don’t take it some other city will. Then they acquire the equipment, they create a paramilitary unit, and everything seems fine. In today’s Mayberry, Andy Griffith and Barney Fife could be using grenade launchers and a tank to keep the peace. A rapidly expanding Pentagon program that distributes used military equipment to local police departments — many of them small-town forces — puts battlefield-grade weaponry in the hands of cops at an unprecedented rate. Through its little-known “1033 program,” the Department of Defense gave away nearly $500 million worth of leftover military gear to law enforcement in fiscal year 2011 — a new record for the program and a dramatic rise over past years’ totals, including the $212 million in equipment distributed in 2010. The surplus equipment includes grenade launchers, helicopters, military robots, M-16 assault rifles and armored vehicles. And the program’s recent expansion shows no sign of slackening: Orders in fiscal year 2012 are up 400 percent over the same period in 2011, according to data provided to The Daily by the Pentagon’s Defense Logistics Agency. Passed by Congress in 1997, the 1033 program was created to provide law-enforcement agencies with tools to fight drugs and terrorism. Since then, more than 17,000 agencies have taken in $2.6 billion worth of equipment for nearly free, paying only the cost of delivery. Experts say the recent surge is simply the continuation of a decades-long trend: the increasing use of military techniques and equipment by local police departments, tactics seen most recently in the crackdowns on Occupy Wall Street protesters across the country. But critics of the program say that the recent expansion of 1033 distributions should be setting off alarm bells. “The trend toward militarization was well under way before 9/11, but it’s the federal policy of making surplus military equipment available almost for free that has poured fuel on this fire,” Tim Lynch, director of the libertarian Cato Institute’s project on criminal justice, told The Daily. This comes on top of grants from the Department of Homeland Security that enable police departments to buy vehicles such as “BearCats” — 16,000-pound bulletproof trucks equipped with battering rams, gun ports, tear-gas dispensers and radiation detectors. To date, more than 500 of these tanklike vehicles have been sold by Lenco, its Massacusetts-based manufacturer, according to a report in the Orlando Sentinel. When asked why they need equipment that might seem better suited to Fallujah than Florida, many police point to safety concerns, even as violent crime nationwide has fallen to 40-year lows. Sheriff Bill Hutton’s department in Washington County, Minn., purchased a $237,000 BearCat four weeks ago using a federal grant. Hutton said it has already come in handy during a kidnapping. His department also received grants to buy a 3-foot-tall, $70,000 robot and a $75,000 riverboat, he said. Over the last several years, he said, his department had collected equipment worth $2 million to $3 million. The take included M-16s, helmet-mounted infrared goggles, four remote-controlled inspection robots, a mobile command unit worth $270,000 and a “Puma” armored tactical vehicle. While the equipment is free, the cost of maintenance, insurance and upkeep falls on law enforcement. In 2010, city leaders in Tupelo, Miss., debated whether to return the police department’s helicopter after spending nearly $274,000 maintaining it for five years. The helicopter flew an average of 10 missions per year. Administrators of the 1033 program rely on state-level coordinators to assess whether a department qualifies for the equipment they request. “They’re the ones who verify for us that the ‘West-wherever Police Department’ is, in fact, a police department, and yes, in fact, it has five sworn officers,” said Kenneth Macnevins of the Defense Logistics Agency, which oversees the 1033 program. Some skeptics say acquiring military hardware can lead to a desire to use it, even when it’s not needed. “It’s kind of had a corrupting influence on the culture of policing in America,” the Cato Institute’s Lynch told The Daily. “The dynamic is that you have some officer go to the chief and say, people in next county have [military equipment], if we don’t take it some other city will. Then they acquire the equipment, they create a paramilitary unit, and everything seems fine. He and other critics of the policy highlight incidents in which heavily-armed SWAT teams injured or killed innocent people. Earlier this year, a grandfather of 12 who was not suspected of any wrongdoing was killed in Framingham, Mass., when a SWAT team member accidentally shot him. In 2008, police raided the home of a mayor of a small Maryland town, broke down his door and killed his two black Labrador retrievers. They interrogated him and his mother-in-law for hours regarding a drug ring to which they had no connection. As the number of SWAT raids has ballooned from a few thousand per year in the 1980s to 50,000 per year in the 2000s, the risks of such tragedies occurring rises. 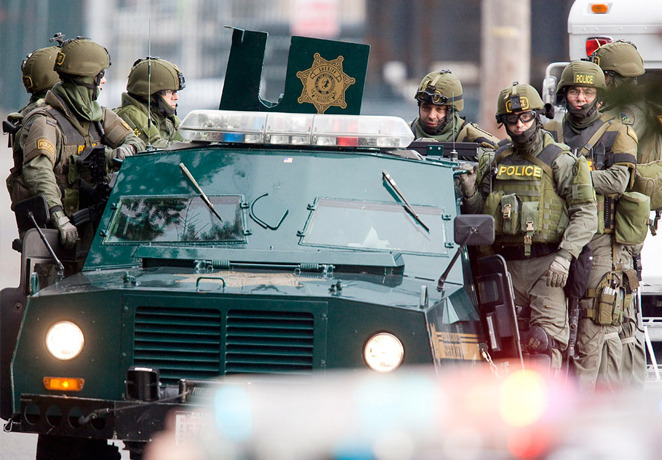 For Joseph McNamara, former chief of police in Kansas City, Mo., and San Jose, Calif., the militarization is not only risky, but also counterproductive. The police force of Erie, Pa., has worked to avoid that perception by taking its BearCat out into the community. SWAT team commander Lt. Les Fetterman told The Daily that his department took the armored vehicle to a city picnic, where “a couple hundred inner-city kids” played in and around it. For some critics, though, the concern is not alienating neighbors, but the change in attitude of police themselves. Arthur Rizer, a Virginia lawyer who has served as both a military and civilian police officer, stressed that their outlooks and missions are fundamentally different. “If we’re training cops as soldiers, giving them equipment like soldiers, dressing them up as soldiers, when are they going to pick up the mentality of soldiers?” he asked. You can go apply for free weapons for your community, your church, your preschool, synagogue, or knitting club. We should fill out the proper paper work then wait for the weapons to arrive in OB. Does anyone have a P.O. box? what are you like 12 years old? At war with the citizens in this country!!!!! It is worse than you think. Thousands of American police have gone to Israel to be trained by Israeli occupation forces, much is sponsored by ADL. Read the linked article by Max Blumenthal: How Israeli Occupation forces, Bahraini Monarchy Guards Trained U.S. Police for Coordinated Crackdown on “Occupy” Protests.